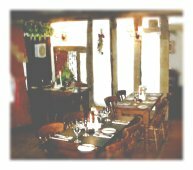 The Old Crown dates back to 1368. It has a splendid restaurant with a 75 cover capacity and it was essential that the restaurant attracted a volume of customers to go towards recouping the £1.7m restoration budget. Metropolis 2 launched the venue to the people of Birmingham, generating extensive media coverage and attracting diners of the right profile, while further stimulating people to talk about "The Old Crown" and its food. Local radio was the ideal conduit to reach the target audience. The agency's media department identified BRMB/Capital Gold as the ideal station offering drive time exposure. The advert had to be both effective and memorable. David Gillan, the chef, is one of the few in Birmingham cooking real food. He is also a charismatic Geordie with a wealth of international culinary experience, making him the ideal vehicle. David as a personality would differentiate "The Old Crown" from its competition. We recorded some 45 minutes of David talking about his culinary creations as he reclined on the four-poster bed in the venue’s Elizabeth suite. He covered ingredients, preparation and the serving of his food. His Geordie accent and sincere passion for the subject came across very well. Editing gave us six adverts, which were run on 96.4FM BRMB, part of the national Capital radio group. The campaign was a huge success with patrons asking to meet David. Also, as a test as to the effectiveness of the campaign, the key dish of "Fresh Sea Bass with Ginger" was only featured on the advert, not the menu. This dish became the single most requested dish for the month that "Passion" was aired. 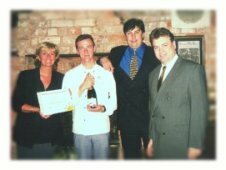 The advert went on to win a national radio award for being the best commercial throughout the whole Capital Group, and the award presentation was held at The Old Crown itself.